To ask other readers questions about The Book of Signs, please sign up. 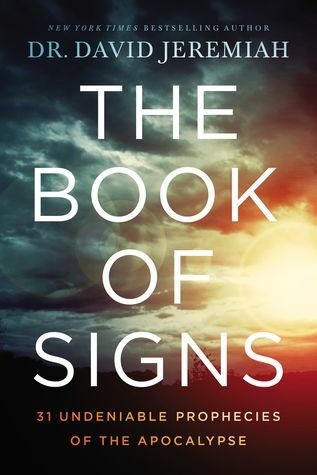 With that aside I LOVE digging deep into Bible so I just had to dig into this book about Signs. I found the first few chapters to be what I wou I love Dr. Jeremiah, matter of fact My husband and I watch him on tv a lot. I have just about all of his books, and have watched just about every sermon, so when I tell you if your familiar with Dr. Jeremiah you will notice in this book there are a lot of what I call Deja Vu , some of his material in this book is from sermons and some of his other books. Dr. David Jeremiah, founder of Turning Point Radio and Television Ministries and senior pastor of Shadow Mountain Community Church, felt God’s calling on his life at a very early age. Born February 13, 1941 in Toledo, Ohio, Dr. Jeremiah was raised in a family deeply committed to ministry. At the age of eleven, Dr. Jeremiah and his family moved to Dayton, Ohio where his father, Dr. James T. Jeremia Dr. David Jeremiah, founder of Turning Point Radio and Television Ministries and senior pastor of Shadow Mountain Community Church, felt God’s calling on his life at a very early age. Born February 13, 1941 in Toledo, Ohio, Dr. Jeremiah was raised in a family deeply committed to ministry. At the age of eleven, Dr. Jeremiah and his family moved to Dayton, Ohio where his father, Dr. James T. Jeremiah, was the Pastor of Emmanuel Baptist Church, and in 1953 became the President of Cedarville College in Cedarville, Ohio.